is rarely yet to find. Antique flavours and details, small touches of modernity wisely embellish the pretty and refined design of Hotel Lucrezia. Ideal for dynamic travellers of all ages, who desire to discover the thousand secrets of Sardinia. The Hotel Lucrezia is located in a historical house in the heart of the village of Riola Sardo, a few miles away from the West Coast. Oristano is at 10 km distance and the nearest beach Putzu Idu at 12 km. 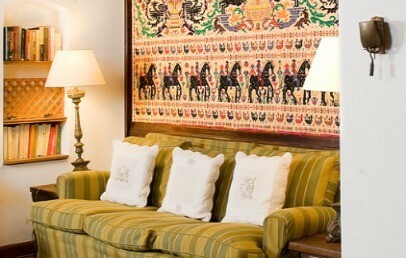 Charming suggests to the guests who will choose the Hotel Lucrezia to rent a car to better enjoy the Oristano area. Check our top rates for car rental in Sardinia and book directly online. In the courtyard of the hotel the atmosphere of old times is still kept, with formerly activities connected to fieldwork that were performed in this house. There are still to find the wine cellar, the old well, the old grain wheel, the old oven to bake bread, everything surrounded by age-old trees. 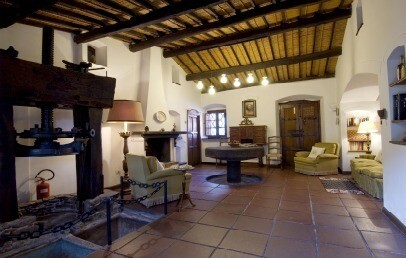 The oil-mill and the millstone were restored and integrated in one of the living rooms. 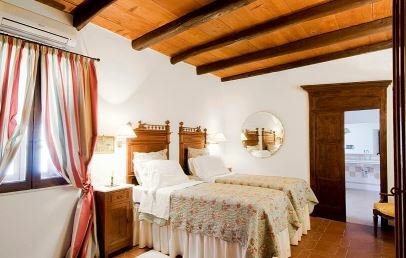 The Hotel Lucrezia is a sober testimony of the austere Sardinian country life and is the ideal place for those looking for relax, privacy and a deep contact with the rich nature of the area of Oristano, as well as for those interested in playing golf, thanks to the close Golf Course of Is Arenas Golf Course. The eight double rooms are furnished with unique handmade pieces of the late '800. The atmosphere of the past gets along well with all the comforts of modern life. 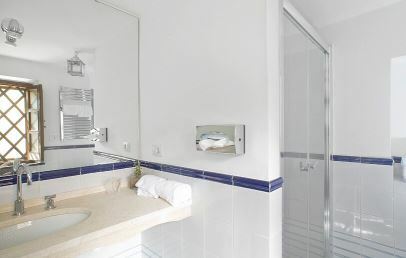 Each room has private bathroom, internet connection, minibar, satellite TV, air conditioning, safety box. At the Hotel Lucrezia you can enjoy the continental breakfast from 8 to 11 am with a delicious and various sweet and savoury dishes. On request and upon advance reservation (preferably early afternoon), guests can dine each evening in the pretty garden (with good weather conditions). The chef prepares a full menu with appetizers, first and second plate, side dish and dessert. Small pets allowed (on request) with a supplement of € 10 per day for the room cleaning, bed and bowl. 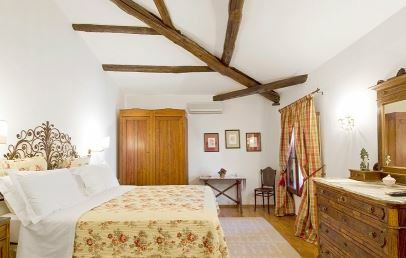 Elegant wood ceiling double room, furnished with unique pieces of the nineteenth century and refined drapery. The bathroom has a tub or shower. All Standard rooms have a window. A nice Suite with double and living room. It presents handmade ceilings, characterized by the ancient technique of the woven cane. Refined details, such as the ancient stone grain wheel and the wooden oil press mil, recalled the memory of the past. 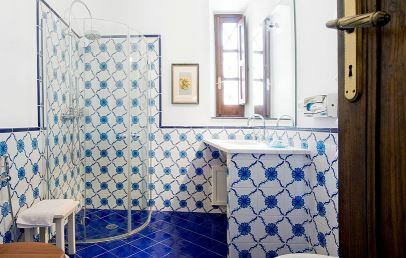 The private bathroom is equipped with sink and shower, made of a local hard stone, “Biancone” from Orosei, while the floors are hand painted ceramic tiles.